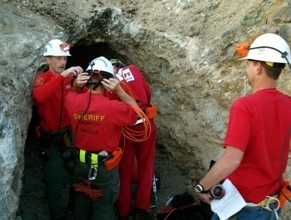 Established in 1963 to fulfill a need for a search and rescue unit in the eastern part of Kern County, the Indian Wells Valley Search and Rescue Group, Inc., is the only all-volunteer mine rescue team in the Southwestern United States to be MSHA (Mine Safety and Health Administration) certified for mine rescue. Our mine rescue activities largely involve many abandoned mines in Kern County and neighboring areas, and we are continuously training and practicing to improve our skills. We use oxygen-breathing apparatus, study search and rescue techniques for working mines, aqueducts, and tunnels, and make familiarization visits to active underground work sites. This means that we can successfully support mine rescue teams of working mines as a backup team in the event of a mine disaster. Due to the seriousness of earthquakes in California, the Team has also trained in Heavy Urban Rescue since 1991 so we can efficiently cope with an earthquake disaster in the Indian Wells Valley. All members are trained in mine rescue, man tracking, rope rescue, downed aircraft location, first aid, urban rescue, cave rescue and related techniques. The Indian Wells Valley Search and Rescue was incorporated as a non-profit organization in 1968. Our support for equipment and operations comes from private and commercial donations. IWVSAR is a United Way agency, and all our members are volunteers who give generously of their time, talents, personal equipment, and cash to support the mission of the Team.